I used to be embarrassed to shop at the dollar store. I thought it was for old folks and people who just hadn’t gotten the great news about Target yet. Don’t go hog-wild and buy everything at the Dollar Store, just because it’s “a dollar.” I learned this lesson during my coupon days, too. Ooo, bubble gum scented air fresheners are only $.34 cents a can! I’ll take them all! Even though “$1.00” sounds good, it’s still pricey for some items, so just use your head, and don’t buy things you don’t need or use. 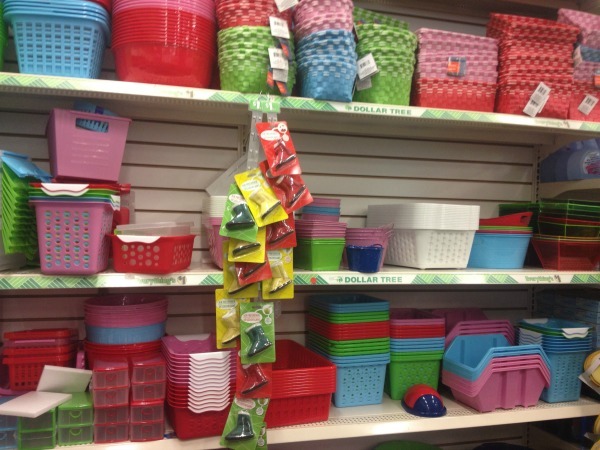 Not all Dollar Stores are created equal. In my region, I like the Family Dollar and the Dollar Tree. But there are some dollar stores that oughta be ashamed of themselves. 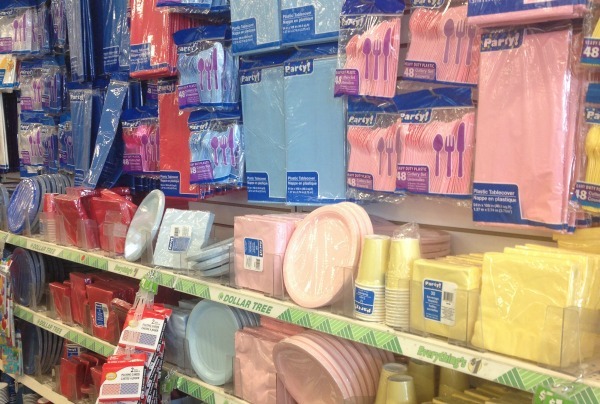 Cluttered, messy shelves, half-made, chincy items…So judge your own store for yourself. I’m not saying that these buys are the lowest deal you’ll ever, ever find in your whole life. If you are a super-shopper, a clearance-aisle master, an expert Amazoner like Stacy, you may have better deals for some of these things. I’ve never been a professional shopper who has my pulse on when nail clippers are on clearance for the lowest price of the season. I have two kids, I’m pregnant, I run a blog, I manage my son’s allergies, and I homeschool. Shopping just isn’t my side job. But what I am saying is that if you find yourself in need of one of these items and you just haven’t seen it on sale, it might be worth a stop at your Dollar Store for a good deal. As a rule of thumb, if I find myself in need of a random item, I check the dollar store first. Plastic baskets and bins – I recently organized my pantry for $7. Totally worth it! Select small toys – great for Operation Christmas Child (Many families shop all year long for this awesome project. Read more about my experience with this group here.) Some of the toys are very cheap, but we’ve found quality balls, coloring books, stickers, puzzles, and small stuffed animals. Batteries – Maybe I wouldn’t use these in our emergency flashlights, but for small toys and around the house appliances, they do the job. 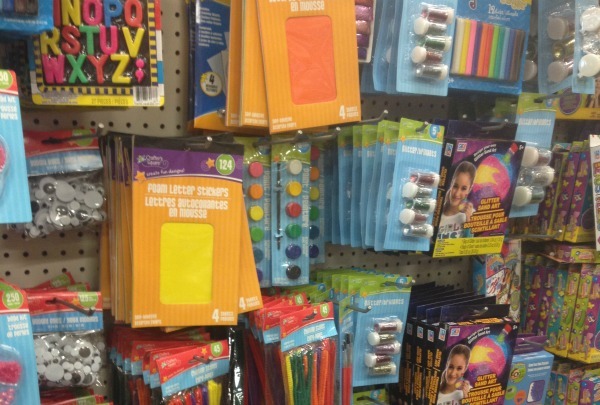 School and office supplies. Here are a few things I’ve bought there with good results: mailing envelopes, stapler, name-brand glue sticks, heavy duty scissors, construction paper, note cards. Arts and crafts – pom-poms, pipe cleaners, googly eyes, glitter, etc. Toothpaste – You can buy “traditional” toothpaste here in the same size as grocery stores, for half the cost. Bar soap – I found an unscented, “clean” kind of bar soap, three for a dollar. I love using totally natural products for our skincare, but it’s nice to have these on hand for back-up. Seasonal items – Right now, our store has kids’ goggles (which are working fine for swim class! ), pool noodles, potting soil, and Easter baskets. Kitchen dish cloths – These are, in my mind, in the same category as mops…You should replace them frequently. generic off-brand crayons – Ugh! Nothing worse! anything that you’re not sure you really will use, because even for a dollar, it’s a waste of money. Do you have a good dollar store near you? What do you buy there? Jessica Smartt is a former teacher who lives in beautiful North Carolina. She blogs at www.smarttereachday.com where she pokes fun at the everyday challenges of motherhood, shares all her amazing allergy-friendly recipes, and rejoices that God still loves her no matter what phobia she has recently developed. She is blessed beyond belief with two Smartt little boys and a husband who can fix anything. Awesome – great addition to the list. It is a GREAT place for school items!!! Pregnancy tests!!! I thought for sure I’d see that on the list! and can be a fire hazard!!! We have a “Deals” by us. Not strictly a dollar store, but at least half the store is still a dollar. Off the top of my head I buy greeting cards, flour sack towels, dish sponges, coloring/activity book, stickers, loofas, pregnancy tests, and the three pack of Chiclet gum :). I used to buy those Swiffer wetjet offbrand replacement – not a dollar, more like $5 – worked just fine. I buy shower liners to use as bed protectors. They wipe dry and you don’t have to wash them every time the child pees at night. Much cheaper at this point in my life to buy 4 waterproof covers. (have 2 children that still sometimes wet at night and would need the extra to remake the bed at 3am.). –Emergency sewing kits (usually the ones in a miniature clear tote) that have scissors, needle threader, several needles, several colors of thread, a couple of buttons and the most recent ones had a small 3′ seamster measuring tape! –Eyeglass cleaning cloth (silky preferably, the felt-ish ones may be too rough for lenses), sometimes in a kit with the cloth, tiny bottle of cleaner and repair kit. If not, they often have repair kits by the registers and small pump spray bottles. –Soap, too. I also have sensitive skin, so being able to get fragrance/dye free cheap is excellent! My Dollar Tree almost always carry Yardley Lavender and Almond scented soaps, which I highly recommend! –Gift bags, wrapping paper, tissue paper and bows. 2-4 pack of “plain” brown is easy to dress up with stamps, baker’s twine, etc. –Scrapbooking paper & stickers/doodads. I don’t scrapbook, but I use them for other things. I’ve found typewriter keys, photo frames, keys, little jungle animals, but YMMV. –Their “Febreeze” in the plastic container (not aerosol). It works great, and I always carry a small 3oz in my bag. –Doggie rope toys, cat toys, pet dishes and placemats. This row is where I find a different spray for pet/strong odors. Usually they have tiny ‘poop patrol’ baggies that fit in those film canister-looking dispensers. Small-medium bags of cat litter for various use. –Bags of kosher or sea salt. Usually the same size as the sugar & flour. –Individual powdered drink mix. 10-12 in each box, and it’s usually Crystal Light! At grocery, the same 12pk is $2-3. –Solar yard lights. I have been getting them at $1 for years, and on average they’ll last (at minimum) a full year. They stock seasonal ones too, so at Halloween we get those specfically to line the walkway. –Glowsticks. Seriously. They’ll have wands, swords, necklaces, rings…glow madness! I keep a few in my car, at work and in camping gear. –Fake flowers for wreathes, graves, memorials, crafting. Also green floral foam and floral wire. –Bubble pack envelopes are 2-3pks for medium sizes. Another thing to buy at certain dollar stores… Pregnancy tests!! I don’t know about all the dollar stores, but Dollar General keeps $1 pregnancy tests behind the counter. You have to ask for them, and they are very “bargain basement” looking, but they get the job done. ha…your comment about sun glasses is so me…I found a pair I liked at the Dollar Tree years ago and went back and bought 10 pair…think I am down to the last 2 pairs…bummer….but they work great and if I lose and or break them…its not a big deal….I also a few years ago realized that I needed “cheaters” (reading glasses)…get those at Dollar Tree also and have them everywhere…car, purse, desk, in the living room, dining room, kitchen and beside my bed…why pay 6 to 8 dollars for them!! I too am a “Dollar Store” shopper and love it, but also am careful what I buy!! What an awesome list! We have a Dollar General in our little town, we call it our local “Walmart”…and I love to buy those baskets and items for our OCC shoeboxes also. I’m with you in NOT buying certain things there, but it’s great to get simple things for much less than other stores. Thanks much for sharing these ideas. I think it’s so important for bargain shoppers to not get wrapped up in the bargain. It results in unnecessary purchases, which don’t save anyone money, just as you stated. Great article! Some dollar stores take manufacturer coupons too. So you can get a good deal on toothpaste! I love the Dollar Tree for prizes for my kids in AWANA, party supplies, decorations, gift bags, lip gloss, travel bathroom items. Hmmmm I commented… where’d it go? Stacy, I love the Dollar Store. I just wanted to add that they do take manufacturer coupons and there is no limit on how many you can use at a time. I have gotten deodorant, frozen pretzels, toothpaste, pasta and all free by using coupons. I also like buying the bread they have; which is all name brand and is still good for another 7 days. I buy 5 loaves at a time and freeze them along with hot dog and hamburger buns. I also like to buy some of their cleaning supplies, their vinegar based window cleaner, magic erasers, and toilet bowl cleaner work great when I’m not in the mood to make my own. I buy disposable aluminum pans (9×13) for the casseroles I put in the freezer. 2 for $1 at our Dollar Tree!!! I always shop at the dollar store! We have a “true” dollar store not to far from me where everything really is just $1. I get nearly everything there… Socks, dishes, home decor items, mason jars for canning… You name it. I’m not sure why you would discourage “off brand” crayons though. That’s usually all we buy for my pre-schoolers. They work just as well. And notbook paper is notebook paper. I even buy my printer & photo paper there. All that said, WHY anyone would shop at Target is beyond me! I have never found any redeeming qualities to that store. I, too, am a recent Dollar Store convert! My favorite find is dishpans to use for sensory tubs for my kids. I LOVE my Dollar Tree store! gift bags (I have 4 granddaughters), plastic bins, all party supplies, cards, I also am a foster for National Mill Dog Rescue so pet bowls and cheap leashes (for dogs to wear IN the house), nail polish for my granddaughters (we ALWAYS “do nails” when I see them for a weekend), socks & gloves for OCC. fake flowers for the cemetery (at that price I can change out the arrangement monthly/seasonally). hard candy to bring to work and set out, plastic bowls to put the candy in. and I also get food for food drives/food pantry (as long as it’s not more expensive than at the grocery store) I don’t get hair bands there, they are not heavy duty enough, nor do I get any “electronic” accessories or make up. I love my local Dollar Tree! Other than some of the other things you mentioned, I also buy their version of Oxi-Clean there! I don’t use it in every load of laundry, just occasionally when the kids get into something “stain-y”. And for a buck, you just can’t beat it! I buy stuff for organize and I always buy sunglasses there. If it not me losing my sunglasses the kids broke them. I have got food from the dollar store from time to time. Where I live, I have a few dollar store to go to and then are all different. It depends on which part of the city you live in. Thanks for the list – good ideas! Do the sunglasses at your dollar store have good UV protection? I almost bought a pair for my kids, but there was no sticker saying it protected against UV rays, so I didn’t dare buy them. I could not agree more on all this…even the Target comment, LOL! 😉 I love the metal tins.